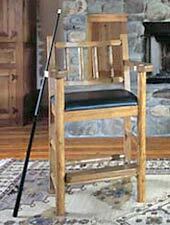 Each of the various chair styles on this page can be built to match other game tables and furniture in a particular style. Contact us for information on chair variations or styles not shown in these pictures. The Spectator Chair (left) combines function with comfort and is perfect for tableside viewing. Each chair has two cue notches and leather-lined drink holders. They are 30-inches high and have a choice of embellishments. This chair comes in 2 variations, the original ladderback model (shown top left) and the newer one with an upholstered back (shown bottom left). 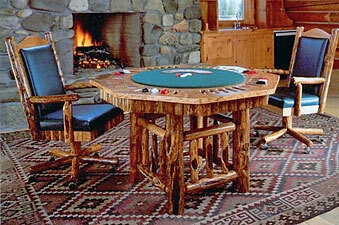 Game Table Chair (right) works well with the 2-in-1 tables. Shown in both the Standard and Wilderness versions with the Wilderness 2-in-1 Poker table, the basic chairs are produced with vinyl upholstery. 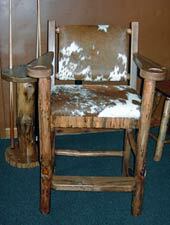 Leather or cowhide are available for an additional charge. 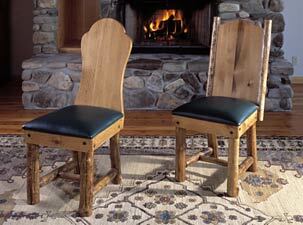 In order to provide more seating around our game tables, we offer these two side chair styles (shown right). 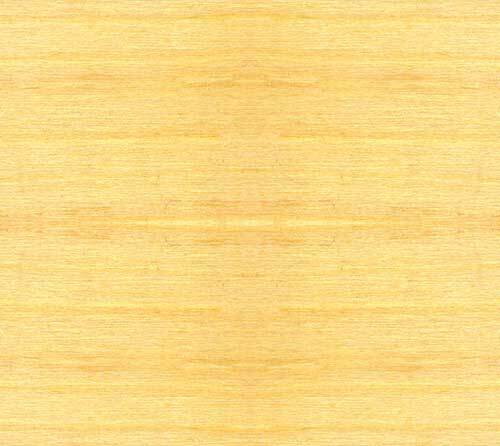 The keyhole style (on the left of the 2) is the smaller of the two for maximum seating, while the log trim side chair (right) complements our tables with a tall back style. Both have upholstered seats which can be covered in a choice of colors. Both shown are Standard versions of the side chairs, with the basic vinyl seats. All of our chairs are available with vinyl or the client's own fabric (with no up charge), or leather, or hair-on-hide (for an additional charge).